This field displays a list of items obtained from a Select command. The information entry serves as a filter of items that will be displayed as it is typed. This list structure is similar to Select HTML object where each item has a value and label associated. For the number Auto-Complete each item value of must be numeric. This list is dynamically loaded with Ajax technology. Validate on submit - Validate fields only when submit. Maximum	Size - Allow to determine the maximum size of the field. Grouping - Allow to define the decimal	separator. 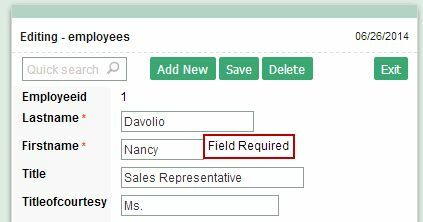 Accepts	Negative - Allow the field to accept negative value. 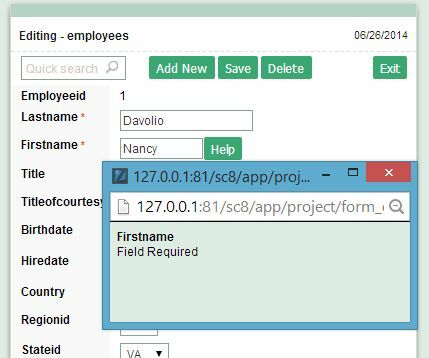 SQL Select Statement - Enter a select comand use to capture the text. 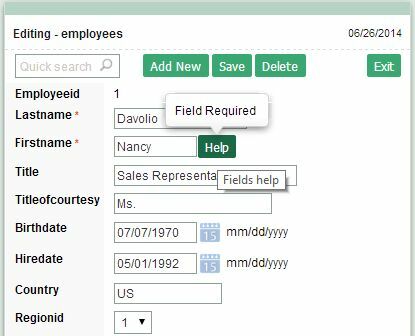 Rows - Defines the number of records displayed on each search. Width - Defines the capture box width (Capture Text). 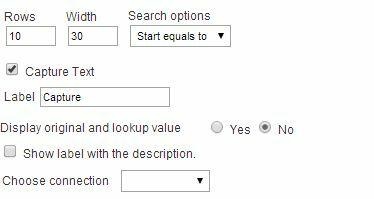 Search options - Defines the texts earch mode (Begin equals, Any part, End equals). It allows determinate the mode of the research of the text (initial equal, any part or final equal). 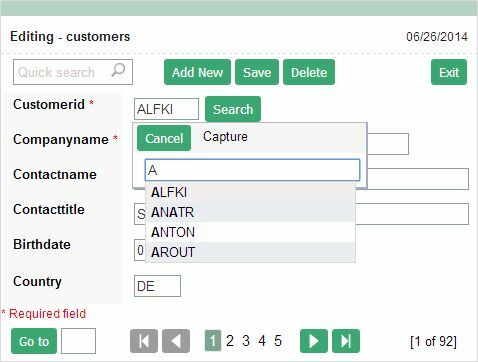 Capture Text - When this option is not selected, there is only one field for data entry displayed in the application. See an example in the link below. Display original and lookup value - When this option is disabled (=No), it shows foe example only the name of the State in the Capture. Display label with the description - Allows you to display the label with the description. Choose connection - Select a different connection.